To say thanks for being our customer, we are hosting a celebration in your honor. We hope you and your family will join us for Alpine’s 13th Annual Customer Appreciation Dinner on Thursday, October 4 from 4:30-7:00 p.m. at Johnson’s Reception Hall in Elkader. Construction continues in Marquette as we work to place drops to homes and businesses. If we haven't been to your home or business yet and you live in the "Bench" area, let us know you want fiber by calling 563-245-4000. Weather permitting, on Tuesday, May 29th, West Union Trenching will start constructing the 100% fiber-optic Fusion Network in downtown Marquette, Iowa. As a reminder, construction will occur between the hours of 7:00 a.m. and 7:00 p.m. Monday through Thursday. You may see contractors working in the area on Fridays performing cleanup tasks. We assure you that our goal is to treat your property as if it were our own. If you have any specific concerns about the work planned for your property, please contact us, ask for Chad Ruegnitz our Outside Plant Manager, and he will be happy to meet with you. Simultaneously, construction crews will be injecting fiber optic cables into the conduit in the “Bench” neighborhood. We believe connected communities become thriving communities and Alpine’s investment in fiber-to-the-home connects you faster than ever before. After boring or digging the narrow trench required to install the fiber cable, workers will restore residents’ yards to a condition as close to the original as possible. Alpine Communications began construction of its Fusion fiber optic network in Marquette at the start of May. West Union Trenching and Finley Engineering, who are aiding Alpine with the project, have started work in the “Bench” neighborhood first, then will progress toward downtown Marquette. The project will wrap up in the Pleasant Ridge neighborhood, of McGregor, marking Alpine’s first major project to extend Fusion fiber optics into its rural territory. According to Alpine, the project will take approximately 120 days, with the first 90 days consisting of the construction phase, where cable is installed in the neighborhood. During the second phase, fiber splicers will make all of the connections to the network. The third and final phase is service activation, where Alpine technicians will “cut-over” customers to the new fiber optic network, enabling faster broadband speeds and improved service quality. Construction hours for the project are between 7 a.m. and 7 p.m., Monday through Thursday. Residents may see contractors working in the area on Fridays, depending upon the weather. If residents have any specific concerns about the work planned for their property, please contact Alpine at (563) 245-4000. Alpine Communications expects minimal to no disruption of telephone and Internet service while the fiber optic network is built. All Alpine Communications customers in the service area will automatically be part of the Fusion Network upgrade and cannot opt out of the Fusion Network. The company’s old copper network will no longer be maintained and will be retired once service is cut over to fiber. Customers who are happy with their current Alpine Communications services can continue to receive them; they will simply be delivered over fiber instead of copper. If residents do not currently subscribe to services from Alpine Communications, they are strongly encouraged to allow crews to construct the Fusion Network on their property at this time. One of the benefits of fiber, said Alpine, is its increased reliability compared to a copper network. Fiber is less susceptible to corrosion or power surges from lightning and other sources, and its higher stability means less frequent service interruptions. Fiber also provides customers with access to faster internet speeds. There is virtually unlimited bandwidth capacity, and the annoying buffering or internet slowdowns often experienced during peak usage times will be resolved. In addition, customers will see enhanced performance of online activities, including streaming video, internet TV, video chats, gaming and smart home technology. Fiber will better meet the needs of households with multiple users and devices. According to Alpine, fiber adds value to homes and communities, as well. Along with the $5,000 increase in home valuation, it levels the playing field, giving businesses in smaller communities the ability to better compete with those in big cities. Opportunities for local economic development can be expanded. For additional information, visit join.alpinecom.net. Details about construction progress will be regularly posted on the website and on Alpine’s Facebook page. Alpine Communications is excited to begin construction of the fiber optic network to all homes and businesses within the city limits of Marquette and the Pleasant Ridge neighborhood. Construction of the Fusion Network will begin May 1, 2018. Construction hours are between the hours of 7:00 a.m. and 7:00 p.m. Monday through Thursday. You may see contractors working in the area on Fridays depending upon the weather. Alpine Communications hired West Union Trenching and Finley Engineering to aid them with this project. Alpine Communications expects minimal to no disruption of telephone and Internet service while we build the fiber optic network. The project from start to finish will take approximately 120 days. If you have any questions, please contact Alpine Communications at (563) 245-4000. Alpine Communications is pleased to announce that we will be making a major investment in a state-of-the-art network that will provide a 100% fiber-optic connection to businesses and households in Marquette and the Pleasant Ridge neighborhood. Besides providing high levels of reliability and sound quality, the Fusion Network will allow us to deliver ultra-fast internet service while ensuring that we’ll be able to offer whatever exciting services the future brings. We are making this investment because we believe it will contribute to the economic vitality of the area and allow us to serve this great place we call home with the best communications network available today. Homes and business will benefit from the 100% fiber-optic Fusion Network. We will be upgrading the city of Marquette and the Pleasant Ridge neighborhood to fiber optics. Construction on the fiber-optic Fusion Network will begin in May and is scheduled to continue through the summer. To prepare for the start of construction, Alpine field technicians will be visiting your home and/or business within the next few weeks to discuss the project with you in further detail. They will work with you to determine the appropriate place to install a new Optical Network Terminal (ONT) on your home to replace the existing box. Our technicians will also want to talk to you about what underground wiring, piping, etc. exists on your property. All Alpine technicians will be wearing company shirts and have company identification on them. Please review this FAQ sheet or call us at 563-245-4000 with questions. When is construction starting and what do I need to do? To prepare for the start of construction, Alpine field technicians and contractors are surveying the area. 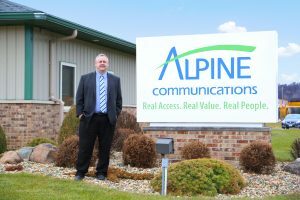 Alpine Communications General Manager Chris Hopp stated, “You may have already noticed an increased presence of Alpine Communications vehicles and technicians in your neighborhood. Starting in April, Alpine technicians will visit all homes and businesses in Marquette and the Pleasant Ridge neighborhood to discuss the fiber project with customers. Alpine employees will be wearing company shirts and have company identification.” Construction of the network will begin in May and service activation will be completed throughout the summer and early fall of 2018. Residents will be notified before construction begins in their neighborhood. The area's premier choice in television viewing is FusionTV. With FusionTV in your home, you enjoy a clear picture in every kind of weather with more choice and more control! View our full channel lineup here. Alpine Communications is pleased to announce the launch of their all-new fiber optic Fusion Network to all homes and businesses within the city limits of McGregor, Iowa beginning on October 9th. Once activated on the new Fusion Network, current Internet customers can look forward to receiving increased Internet speeds at no extra charge. Plus, Alpine will also begin offering FusionTV — a new and enhanced television viewing experience with over 230 channels, over 90 high-definition networks, and whole-home DVR. Introductory specials will be available for a limited time.